"Cards are war, in the disguise of a sport"
Anthony Boucher (rhymes with voucher) tends to linger on in our collective memories as a critic, whose compendium of newspaper reviews, published under the title The Anthony Boucher Chronicles: Reviews and Commentaries (1942-1947), has become an important reference guide for contemporary mystery fans excavating the genre's lost history, but aside from penning critical commentary, science fiction stories, radio plays or compiling anthologies he also has seven detective novels to his credit – including a triad of books in which he confronts his private shamus, Fergus O'Breen, with a few very familiar tropes. The Case of the Solid Key (1941) has him jimmying the door of a locked room problem and The Case of the Seven Sneezes (1942) drops him off on an isolated, cut-off islet with a murderer and an entire cast of suspects. 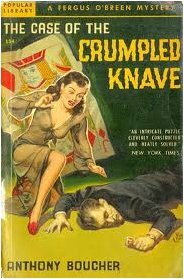 Boucher's second endeavor as a mystery novelist, The Case of the Crumpled Knave (1939), takes a stab at the Queenian motif of the dying message. Humphrey Garnett was a former research scientist, attached to the military, who has contented himself with doing private research from his private laboratory, collecting vintage playing cards, playing four-handed chess and worked on a five-pack solitaire, but he was not granted the time to complete these projects. Someone spiked his drink with poison and the only clue the police have to go on is a crumpled playing card they pried loose from Gernett's cold dead hand. Luckily for them, Colonel Rand arrives from New York City at the home of his old friend and he has a telegram that could refer the entire case to dusty, cobweb strewn archives where the police store their solved cases. Before he faced his would-be-killer, Garnett dispatched a telegram to his old friend, Colonel Rand, asking him to come to Los Angeles because he might be an important witness at the inquest of his body. It turns out to be a pretty accurate prediction. Colonel Rand identifies Richard Vinton, engaged to Kay Garnett, Humphrey's daughter, as a cardsharp who used to work aboard ocean-liners and the one to whom the crushed knave of diamonds must refer to, however, his fiancé is not convinced and engages the services of her old childhood friend, Fergus O’Breen, who has just opened up shop as a private investigator. Now that trouble is his business and daily bread, he decided to take on the case. 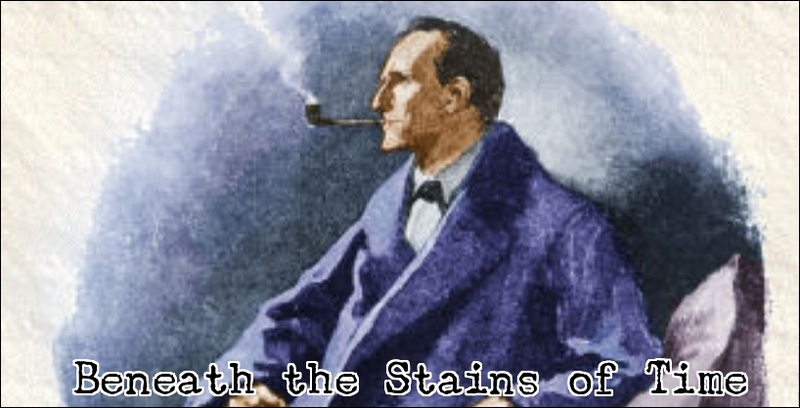 O'Breen goes over the Garnett household with a fine toothcomb and examines Kay herself and her ineffectual uncle, Arthur Willowe, the lab-assistant and Vinton's rival, Will Harding, the mysteries Camilla Sallice and few outsiders, but it's one of the attendees of the classic drawing room scenes who sees the truth after O'Breen delivered a clever, but wrong, solution and both of them have a specific problem. The false solution appears to be lifted from a Nicholas Blake novel and has nothing new to offer to a seasoned mystery reader. The correct solution is not bad, but, as it is explained, you realize that you already knew basically everything that is being told except that everything is now in its proper place and context. I can see and appreciate what Boucher was trying to do with this novel, but I can also understand readers who say "Oh, is that all" after reading the final chapter. Still, the final part of the book might not deliver the punch promised in the set-up, but it's still better than some detective stories I have read that were actually a mess. I also enjoyed the characterization (especially of the amiable Colonel Rand and the pathetic and longsuffering Arthur Willowe) and the entertaining writing, which included some self-referential humor and even a bit of lamp shading ("It's against all rules,” Fergus groaned in desperation. “A new character at this hour!”). However, it was not all laughs and giggles as there were also a few interesting tidbits on playing cards and an interesting discussion (read: condemnation) of modern warfare and all of its horrors – especially against unarmed citizens. It's a bit discomforting to read knowning what the world had to look forward to in 1939. Anyway, not a perfect detective story, but good enough to warrant a read if you're a fan of either Boucher or the Queen-Van Dine style detective novels.